It's time for another edition of my Most Coveted List! Here are 5 things that I'm obsessed with right now. 1. Campagnolo Roma. 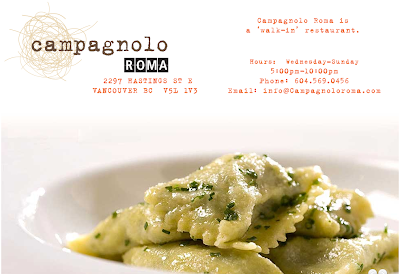 An offshoot of the popular Campagnolo pizzeria on Main St., Roma is the newest restaurant to join the Hastings Sunrise neighbourhood, specializing in the traditional flavours and foods of--you guessed it--Rome and Southern Italy. I'm embarrassed to say that since it opened less than a month ago I've already been back 3 times; it's just that good. Try their seasonal spot prawn specials and the delectable Romana pizza. 2. Popchips. Popchips are made from a potato-based flour and popped, not fried or baked. They're also gluten-free and contain no cholesterol, trans fats, saturated fats or preservatives, and at roughly 100 calories a serving, they're a guilt-free alternative to the chips, popcorn and pretzels you usually reach for. As a devoted muncher of countless bags of kettle-cooked chips, I was skeptical that these could rival my preferred snack. But Popchips have a satisfyingly crunchy texture and come in some pretty tasty varieties. My favourite was the salt and pepper flavour. 3. 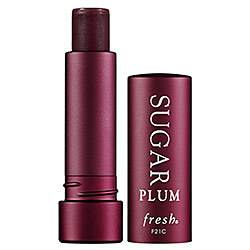 Fresh Sugar Plum tinted lip treatment SPF 15 ($26; available at BeautyMark). This lip balm is one of many SPF products I'm reviewing for an upcoming post, but I love it so much that it deserves to be spotlighted in its own right. The texture is rich and luxurious but never sticky, and the formula lasts a long time once applied. Although it looks quite dark in the tube, the tint is actually sheer and pinkish-plummy. Add to that the sugary scent, SPF 15 and a naturally sourced ingredients list free of harmful chemicals and you have a lip balm sure to become a summer essential. 4. Colourful clothes, particularly those in a palette of bright oranges, pinks, navy blues and beiges. I could stare at these pieces all day long; to me, the hues combine to form the most perfect summer capsule wardrobe imaginable. From left to right: Diane von Furstenberg 'Olivia' dress ($330.81), Ella Moss 'Liberty' strapless dress ($160.83), Dolce Vita 'Lanie' high waist shorts ($89.57), Rebecca Minkoff 'Tatiana' sleeveless blouse ($171.01), Madewell 'Sunday Stroll' shirtdress ($171.01). 5. Pinterest. Cloud computing meets mood board creating in this delightful new platform. 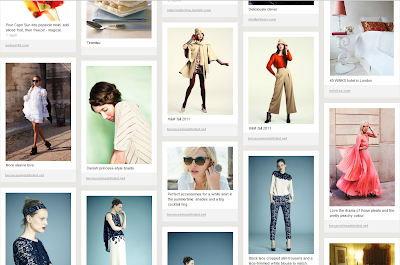 I started my Pinterest account on the weekend and it's already become an addiction. It's intuitive and easy to use, plus it lets you create multiple boards to pin images by category. It even comes with a Pin It function you can add to your web browser toolbar so you can pin while you surf. Easy peasy and a lot more manageable than Tumblr for mood board/collage purposes. Who else is on Pinterest? WHOA. That pasta looks incredible. Great list, thanks so much for sharing! I've been wanting to try the Sugar balm for summer-I really need the SPF and I love having a tint of color-I'll definitely need to pick it up since you speak so highly of it. I am obsessed with popchips, i'm more into the sour cream and onion flavor. hahah i bought popchips and my friends ate them all.. so i didn't even get a chance to be obsessed!